In The Hidden Village, whom can you trust? All it takes is one small fatal slip to change the course of all their lives forever. Deep in the Veluwe woods lies Berkenhout, a purpose-built village of huts sheltering dozens of persecuted people. But the Germans can find no proof of its existence. The whole community pulls together to help the Berkenhout inhabitants adjust to a difficult new life and, above all, stay safe. Sofie, a Jewish Dutch girl, struggles to adapt to living in Berkenhout, away from her family and friends. As weeks turn to months, she’s worried they’ll abandon her altogether. Young tear away Jan likes to help, but he also enjoys roaming the woods looking for adventure and fallen pilots. His dream comes true, until he is found out. Henk is in charge of building the underground huts and organizing provisions to Berkenhout, but his contact with the Germans arouses suspicions. Whom can you trust? All it takes is one small fatal slip to change the course of all their lives forever. This is a powerful, inspiring, heart breaking audiobook that you can’t stop listening to. It is fiction but is loosely based on the hidden villages in Holland during the war – it was something that I had never learned about and encouraged me to learn more. Based in WWII, it follows the kindness and bravery of a group of people determine to protect those persecuted from the Germans. They create their own little hidden Village deep in the woods, far from the German’s eyes but not so far that they can live like a normal village. The people take great risks to not only get the individuals to the Village but to get them supplies, food and ensuring that no one else finds out about the group. It is an inspiring story about the bravery and kindness of ordinary people who did everything they could during the war. It had me in tears at times at the unfairness and other times smiling at the ability of the children to still find the good points in their lives. The children take on such a key role during this time both protecting the people and communicating messages, this can also be a downfall due to their innocence and excitement. The narration in this story is excellent. He manages to somehow capture the innocence and trust of a child – he captures their inability to grasp the complete nature of the seriousness of their situation and how they sometimes only see the unfairness (like when Sofie was mad at her friend for being able to move freely while she was stuck in hiding – she knew it was important to be in hiding but she still felt it was unfair and not right). You felt the urgency in his tone and in the situation when the Germans would come to the homes and it kept you on your seats. He kept the story engaged with his tone and I loved listening to him telling the story. This was a powerful audiobook – you were constantly on the edge of your seat as the village grows and the uncertainty of their situation increases. You were in constant fear that they would be found and your stomach turns every time they come in contact with a soldier. This is a definite must listen to for both young adults and adults alike. You can purchase a copy of this audiobook on Amazon and Audible. Listen to a sound clip here. Imogen Matthews is English and lives in the beautiful University town of Oxford. Before she wrote The Hidden Village, she published two romantic fiction e-novels under her pen name, Alex Johnson. 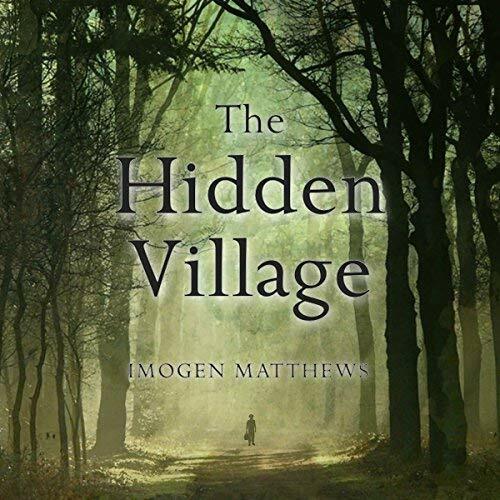 The Hidden Village is published by Amsterdam Publishers, based in the Netherlands. Imogen has strong connections with the Netherlands. Born in Rijswijk to a Dutch mother and English father, the family moved to England when Imogen was very young. Every year since 1990, Imogen has been on family holidays to Nunspeet on the edge of the Veluwe woods. It was here that she discovered the story of the hidden village, and together with her mother’s vivid stories of life in WW2 Holland, she was inspired to write her next novel. Liam is an Irish-born voice-artist with over 10 years experience working in every field of the voice industry. His recent varied audiobook work includes the ‘Deception of a Highlander’ series of 3 books, Little Caesar for Audible, A Christmas Carol, The Tempest and Aviation Training. His regular corporate voice-clients include: Shell, BP, HMRC, HSBC, Hilton, Mondelez, Cadburys, Green & Blacks and many more. He has performed many radio-plays, narrations, animations and documentaries; from the Keith Moon biography to most Shakespeare radio-plays. He is also an Associate Lecturer in Broadcast Voice and ‘Acting for Radio’ at Sheffield Hallam University. He is a communication skills specialist and examiner for the Royal College of Psychiatry, Royal College of Surgeons, Royal Scottish College of Surgery and as such is highly fluent in complicated medical reads with Latin pronunciations. He is also a highly acclaimed stage and screen actor. He studied at Lancaster University and then as a classically trained actor at Mountview. He spent his formative years in the Middle-East which has given him an understanding of different accents and cultures and is able to perform many accents to a native standard; including most UK regions, most Irish regions, most of Europe, Australia and North America, (hillbilly, New York, mid-Atlantic, San Francisco, Chicago, etc.) and is also able to create wildly inventive characters. He has lent his voice to some of the zaniest cartoons and animations written, from grumpy old wizards, to heroes, to South-American monkeys and even a sea-horse with a Scottish accent! He is currently the youngest actor to play the lead role of Prospero in Shakespeare’s ‘The Tempest’ in London’s West–End. His recent production of Brecht’s Caucasian Chalk Circle at the Royal Lyceum Edinburgh won 4 prestigious Critic’s Choice Awards. He has worked for the most renowned theatre companies; from The Royal Exchange Theatre (2 Manchester theatre award nominations) to most regional theatres throughout the UK, including Alan Aykbourn’s SJT, New Vic, Oldham Coliseum, Donmar, Dukes, Nottingham Playhouse, Theatre by the Lake and many more. He also played Jerry in ‘Hollyoaks’ and appeared alongside Catherine Zeta-Jones in the Hollywood feature film ‘Death Defying Acts’. His wide-ranging experience has also seen him perform Opera in ‘Rigoletto’. In his spare time Liam is also a musician, playing violin, drums, piano and percussion, and spends time with Peg, his Springer Spaniel, out in the Peak District whenever he can get away from the studio! Disclosure: I received an audiobook in order to facilitate this review. All opinions expressed are my own.